The Nerf N-Strike Modulus ECS-10 is a big and powerful toy gun that shoots semi-auto rounds with the assurance of great accuracy. This gun has a highly advanced targeting scope that places targets in the line of fire with remarkable precision. You might prefer this blaster than many others within its price range because of its flexibility, which allows you to arrange the gun in more than 30 combinations. The manufacturers intended it to hit long range targets of up to 90 feet with great precision. Its other strong selling point is the dual-rail barrel, which is outstanding with regard to its robustness and performance. * Targeting scope for enhanced precision. * Dual-rail barrel for enhanced capacity. * Strong and stable drop grip. 1. TARGETING Scope for enhanced efficiency. The Nerf N-Strike Modulus comes with a highly efficient targeting scope that guarantees precise and accurate shots. The scope is uniquely designed to achieve greater accuracy when shooting distant targets of up to 90 feet. Besides, the scope is uniquely designed to command wide viewership, which gives you a great advantage in a competitive scenario. Usually, the ability to fire and shoot on targets with unmistakable precision depends a lot on the quality of focus that the scope offers. This Nerf gun features two tactical rails. One of the rails is positioned at the bottom while the other rail is at the top. The dual-rail barrel allows you to attach multiple extensions on the blaster. Despite the fact that the capacity of toy gun is greatly advanced by the dual-rail barrel, it is advisable to limit the number of the extensions to a comfortable level in order to avoid compromising the accuracy of the shots. Wobbling and bending of an overloaded barrel may slow down the shots and reduce their accuracy. As such, it helps to maintain a measure of balance. 3. STRONG and stable drop grip. The designers of the Nerf N-Strike Modulus ensured that the shooter holds the gun comfortably while in action and during moment of inaction. The drop grip feature is uniquely designed to offer maximum support as you aim, shoot, duck in the gaming zone. Besides, this feature ensures that the shooter achieves a firm hold on the toy gun in a way that enhances accuracy of the shots. Getting the right orientation with this toy gun is largely dependent on the combined effect of advanced optics, a firm grip and the exceptional skills of the shooter. The capacity of the Nerf N-Strike Modulus ECS-10 Blaster to discharge powerful shots to the range of 90 feet is largely dependent on its powerful motor. The motor remains highly effective as long as the batteries are sufficiently strong. Youngsters with a particular penchant for bold action will love this gun because of its great motor power. Four genuine AA batteries are required to give this scope the top quality performance and the enhanced level of precision for which it is highly regarded. Current and previous users consider this motor’s capacity as one of the foremost enabler’s of this gun’s capabilities. This toy gun is designed to hold an advanced 10-dart banana clip. This capability is one of its outstanding strengths. The banana clip can hold up to 10 darts, which gives the shooter ample chances of achieving a fully immersive shooting experience on the battle field. Boys from the age of 8 upwards will find this toy gun exceptionally appealing because it is a very close approximation to the real battlefield experience. Unfortunately, its large size makes it inappropriate for 5-year-old shooters with their small hands. This toy gun is robustly constructed with a solid housing that helps to cover and protect its internal mechanisms. The housing also helps to shield the delicate parts of the gun from different levels of impacts and mechanical shocks. The robustness of this toy gun also helps to protect it from the adverse effects of the elements. The powerful firing mechanism of the gun and the recoil effect need a strong housing that can withstand the resultant shocks. * Capable of highly accurate shots. * Strong and durable housing. * Suitable for long range action. * Highly flexible with multiple combinations. * It may jam if the trigger is pulled too fast. * The darts bend easily, which often leads to misfiring. Q. What type of batteries are required for this Nerf gun to work? A. The gun requires 4 AA batteries. Q. 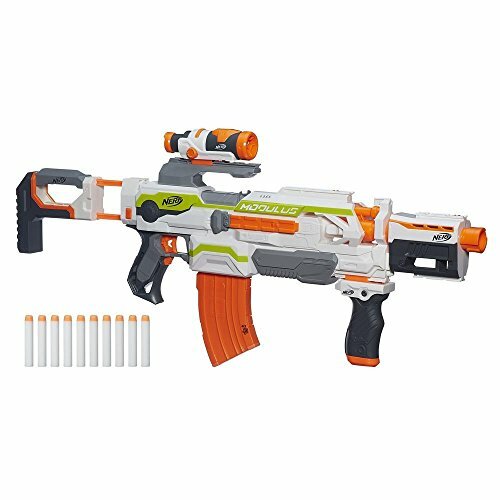 What is the manufacturer recommended age for the Nerf N-Strike Modulus? A. It is recommended for 8-year old children and above. Q. What are the product dimensions of this toy gun? A. The dimensions are 3.3 x 23.4 x 13.1 inches. Q. How much does this toy gun weigh? A. It weighs 3.6 pounds. Hint: click or tap the stars for the most helpful Nerf Modulus ECS-10 Amazon reviews. Get the Modulus ECS-10 Mod Guide!